For good or for ill, Magic 2012 seems to have a fair amount of the Vorthosian, top-down cards. Let’s look at an inclusion from Blood and Fire, the Crumbling Colossus. It’s a giant stone statue that’s hard to get around, and if you need to you can topple it towards your opponent where it shatters on the ground. Elegantly clever and cleverly elegant, no? It’s in that spirit of appreciation for top-down design that we crack open the next deck for review, the Red/Green Entangling Webs. Entangling Webs takes advantage of another flavourful creation, the Arachnus Spinner. A sort of “Spider lord,” the Spinner has a most delightful ability that evokes all the things we think of when we think of spiders. To be certain, the Spider creatures of Magic have had their well-carved niche, well-established as asymmetrically defensive creatures that can block flyers. 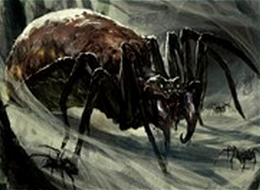 Thanks to a second new card printed in Magic 2012, the Spiders have learned a brand-new trick: Arachnus Web. The Web is solid enough removal in a colour that has precious few such options. The concept is simple: your enemy’s crwature is snared in the spider’s web. If it’s strong enough it can break free, but otherwise it’s stuck in place. Thanks to the Arachnus Spinner, now all of your Spiders can be flinging webs and helping to lock down your opponent’s board. It’s an interaction that infuses Entangling Webs with a great deal of character, helping set it apart as one of the more unique intro decks in the history of Core Set releases. Now that we’re two cards into it, let’s see if the rest of the deck lives up to this standard. Wizards has a long and storied tradition of releasing bloated, overloaded Green/Red decks, Let’s begin by take a small walk back in time, shall we? Note that in the case of Brute Force, it wasn’t the creatures that were the problem, but rather expensive noncreature effects like Rumbling Aftershocks. Also note that our colour-flagging- while arbitrary- isn’t based upon a static number, but is influenced by other ramping options in the deck. Of course, the contrary line of thinking might go like this: so what if the deck has expensive cards in it? If it can hold off the enemy and use ramping options to accelerate its manabase development, shouldn’t it them have the advantage since its creatures are so much better? There’s some truth in that line of thinking, and the top-of-curve option in Entangling Webs give you some impressive two-for-one options when they enter the battlefield. The cause for concern, though, isn’t exclusive to how the game is going on turn 8. Rather, it’s also very much focused on what you see when you deal yourself seven cards and take a look. With this many expensive cards in the deck, you’re virtually mulliganing yourself at the start of every game, and hands with three or more of these bloated, expensive options can hurt you. What good is having an Emrakul in your deck if you can never cast it? The same concern applies here. As the curve illustrates, Entangling Webs doesn’t quite abdicate the early game… but it comes close. A trio of Llanowar Elves comprise your one-drops, and they’re a welcome sight in such an expensive deck. The two-drop slot gives you some early utility and aggression. The utility comes from the pair of Crimson Mages which can give your creatures haste for a fairly inexpensive cost. 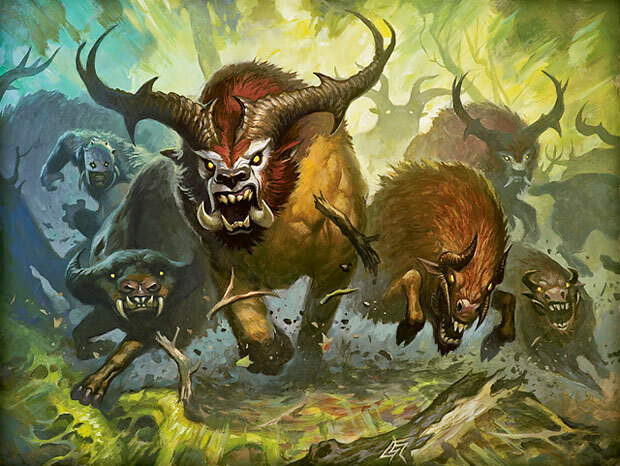 The beaters some in the form of a Runeclaw Bear and Garruk’s Companion. Neither of these are likely to win any games for you, but having them gives you the opportunity to get some early damage in against a slower-starting foe, or to clog up the red zone and slow down the pace of the game to buy time to develop your manabase. As you can see you don’t have a thing to do on turn 3- at least for creatures. As we’ll see, the deck doesn’t let you down there. Beyond that, you have a trio of Giant Spiders at the four-drop as well as a Lightning Elemental. The Elemental is a fairly crappy creature, haste notwithstanding, as it can trade very poorly against some random 1/1 and give you a tempo disadvantage. The Giant Spiders, however, clog up the red zone quite well and are a bit harder to kill, especially since Red direct damage has been toned down a touch in M12 versus M11. As we approach the top of the curve, we begin to get a nice, diverse selection of fat beaters. There is a pair of Stampeding Rhinos, back from Magic 2010. Twin Acidic Slimes give you some targeted removal upon entering the battlefield, but the prohibition against picking off a creature restricts their utility somewhat. A pair of Stingerfling Spiders also give you a two-for-one, this time against one of Green’s classical nemeses: flyers. Then there’s the vanilla Vastwood Gorger, the aforementioned Arachnus Spinner, and a Garruk’s Horde. The Horde shows just how much you get for your mana these days when it comes to creatures- directly on-curve as a 7/7 for seven mana, not only is there no drawback (aside from your opponent always knowing what you’re drawing) but you get the potential for added card advantage. The Spinner deserves some additional discussion here before we move on to the noncreature support. All told, there are a grand total of six Spiders in the deck, meaning you won’t be taking full advantage of the deck’s potential most games you play it. The linchpin of the deck is the Arachnus Spinner and there’s only one copy, so to be at its most effective the deck needs to offer you ways to draw into the Spinner. It’s also important to note that with only six Spiders, you’re not likely to have more than two in play at any given time on average. With only three copies of Arachnus Web, you do the math. You’ll inconvenience your enemy, but the battle will often be far from won. Still, when you have the chance to live the dream- two or three spiders out including the Spinner- the deck will really come alive. Entangling Webs packs in a surprisingly robust noncreature support suite focused on only a few key areas. The first thing to note is the mana acceleration- in addition to the three mana Elves, you also have a trio of Rampant Growths. Given how little this deck expects of you in the early game, a Cultivate would have been much preferred, but alas it wasn’t printed in M12. There’s also some card-drawing to address the need mentioned above. Hunter’s Insight is a nifty trick that you should have little difficulty utilising, given how often you’ll be sending your troops into the red zone. There’s some potential synergy here with the power-boosting effects of some of the other cards in the deck, giving you even more cards to draw. A pair of Greatswords are otherwise somewhat disappointing- a pure power-pumper in a deck that already has plenty up front. Still, there’s a Titanic Growth (the new Giant Growth, now that Giant Growth is not being reprinted in M12) and that nightmare in cardboard form, Overrun. Still, its in its removal package that Entangling Webs becomes truly exciting. There are, of course, the three Arachnus Webs crucial to the theme of the deck. Although inferior to Pacifism in some ways, they function more like a conditional Arrest, and answer another one of Green’s classic weaknesses- killing creatures that don’t want to fight. 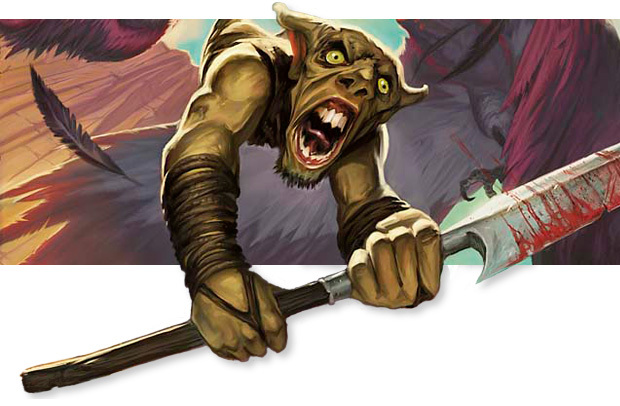 Tappers and other utility spells-on-a-stick run rampant on Green, but the Web now shuts them down- and it’s rare for them to have a power that will let them throw off the web (they’re typically 1- or 2-power). For some burn we have Fling, which is a solid finisher, and there’s also a Fireball. A Slaughter Cry has to be looked at as ‘ersatz removal,’ a generally poor option that can offer good results only under the right conditions. If nothing else, it can always add a few more points of damage to finish off a wounded for, but we’d probably rather have an Incinerate most of the time. Thus ends our tour of one of Magic 2012’s most intriguing decks. It leaves a number of questions open, above all how effective the Spider subtheme will be with and without its standard-bearing foil rare. We’ll put the deck to the test and report back our findings. See you in two days! A cute thing that’s good to know about is that you can spin a web on a larger creature, and even though it’ll fall off at end of turn, it’ll still be immobilized until then. Since you can reuse webs from your graveyard, it’s kind of like turning all your spiders into Thundersong Trumpeters. You’re right! I didn’t realize that you could tutor the webs from the graveyard. That makes the card even more interesting. I think this could be one of the best green precons of a basic set. Interesting. This looks like a non-elf green deck I could enjoy. Spiders. Who knew? Arachnus Spinner is on of the most flavorful foil rares in a long time. Not only that, but you get 3 copies of the web to use, wizards has a habit of skimping you on removal with singleton doom blades and such. Just like the golem deck, it’s key to get ramp in your opening hand, I can see a lot of games if you don’t mulligan aggressively spending the first 3-5 turns doing nothing. Off topic: Just noticed “Archon of Justice” says dies, not when destroyed. Kind of weird.